Well, another December is gone. If my linguistic shift didn’t put them off completely, most of my readers will recognize my routine of wrapping up the year with a reprise of my finest gastronomic experiences. But before I dive into the matter, a few words to bid farewell to 2015 would be proper. Even though I find myself saying this every year with scarce exception, I will do it once more, for I will mean it no less. I think I’ve had my most exciting year yet, and one full of change. For starters, I’m writing this blog in English! How did that happen? Well, because of some more changes. See in January I left Mexico City, my home town, in pursuit of new career opportunities. Living abroad, first in California, now in Switzerland, I realized my new professional endeavors had no expiration date. This first drove me to switch languages on my social accounts and, following a great response, I ultimately decided to follow the same course with the blog. I truly hope my readers still find my content appealing, while I strive for relevance amongst other geographically closer groups. Then, as I already kind of slipped there before, my place of residence is different. I now live in Europe. Right there in the middle, if I may add. Zürich is an interesting place, and I haven’t quite unlocked all of its traits yet. But believe me, I have been trying. The challenge is, coming from Mexico city, the place seems to me like a scale model of a city, and I feel far more compelled to travel around than to delve into my surroundings. What is more, when I have delved, I haven’t exactly been faced with the most satisfying results. Nonetheless, I am positive that I will find the places, products and cooks that are driving the gastronomic revolution around here, and eventually make them the stars of my stories. Back to the blog. I made yet another adjustment to it – I added the Places section. Under it I will file my favorite restaurants, cafes, eateries, luncheonettes, stands, bars, joints, … any food-related locations, really, that I relish, all over the place. An ever-blooming collection of must-visit food spots, personally curated, for my hungry friends. I hope to populate this department with many delights soon for you all to enjoy. Anyway, even I am anxious by now, so I’ll get to it. I present to you the finest culinary executions I tasted in the last 12 months. Spoiler alert: I had one heck of a year. * Same as last year, I decided not make a ranking out of this list. It doesn’t feel natural to me to rank many essentially different experiences, techniques, traditions, circumstances or styles… So instead I took a chronological approach. Ok, so technically I had this dish in 2014, but only after I compiled that year’s list, so it deserved to be considered in this one. I last was in Oaxaca in December, and visiting this restaurant and hotel is just not a question. The place is so hauntingly beautiful, its views so magical, its people so friendly it almost builds up to a fairy-tale-like experience. In my most recent visit we sat down for lunch at around 2 in the afternoon and left late at night, after also having dinner. That’s how enchanting the place can be. Amidst what felt like a tidal wave of mezcal (some of the finest I’ve ever tasted, too) and Oaxaca’s finest produce, we had this dish. Caldo de piedra translates literally to broth of stone, referring to the white hot river stones used to cook it. The whole thing starts with a fish-based broth, very aromatic and intense. 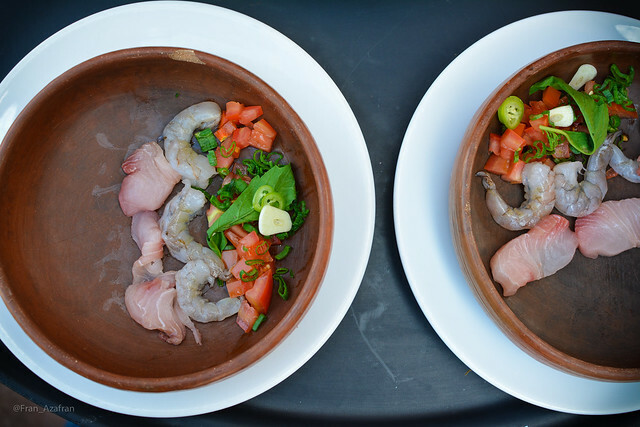 This is then poured over the garnishes: red snapper, shrimp, tomato, chile, garlic and herbs. Finished table side, it’s no shorter of a magical ritual. 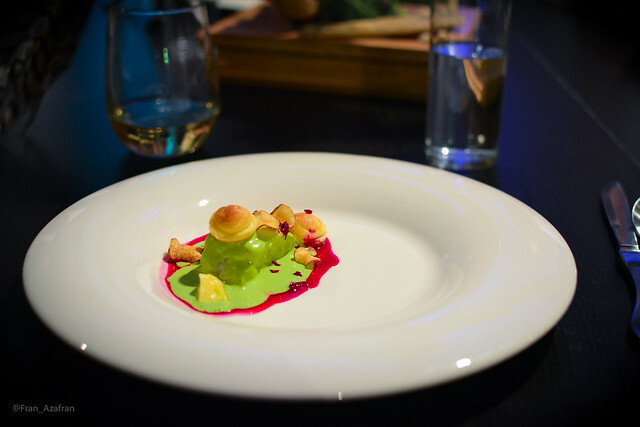 Pop-up dining at its finest – that’s Wolvesmouth. Dinner there is the product of luck and perseverance, since its normally pretty hard to land the seats. A surprise menu and a BYO drinks policy makes the experience even more unique. Top that with the fact that they don’t charge you for dinner, but is rather up to the diner to contribute with however much he desires. One of a kind. For me, the high of the meal came with a plate of sturgeon over a radiant duet of beetroot juice and spinach hollandaise. Its flavors stood up to its looks. The rest of the photos from the dinner are here. 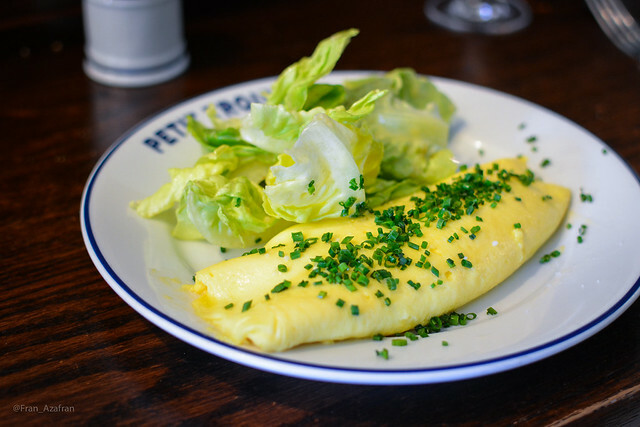 Little sister restaurant to french-born Ludo Lefebvre’s Trois Mec, Petit Trois is just a sensation. Drawing as much press as the British royal family (who’s counting), the success this restaurant has enjoyed since day one is immeasurable. The reason behind: some of the finest french bistro fare in the city, country, the world, probably. Wrapped in a casual but cozy space disguised as an abandoned Thai restaurant, it serves full menu, all day, everyday, without reservations. My meal here was no less than perfect every step along the way, so choosing one plate to showcase its greatness on this list was a challenging task. Ultimately, I had to go with the omelette, since it combines excellence of craft and simplicity to deliver pure love to your senses. It’s fluffy, creamy, eggy, cheesy, perfectly cooked, showing no evidence of it ever touching a pan. BTW, the guys at Bon Appétit have the recipe and a step-by-step so go grab it and remember, practice makes perfect. Chicken and waffles. Classic among classics and a staple of American brunch. Hand it over to Thomas Keller and what you get is the moistest, tastiest roasted chicken with a savory bacon waffle lighter than air. Vanilla butter and chasseur sauce make maple syrup almost feel wrong. Oh my, that delicious brown sauce. Oh my. During a brief pit-stop halfway through the year I made it back to Jorge Vallejo’s haute-Mexican-keeping-it-casual restaurant. I first dined at Quintonil in early 2013, before the accolades and awards and, as hard as it seems, it just keeps getting better. The meal kicked off with a nopal and salicornia ceviche, a perfect sample of the style and quality of the banquet that followed. 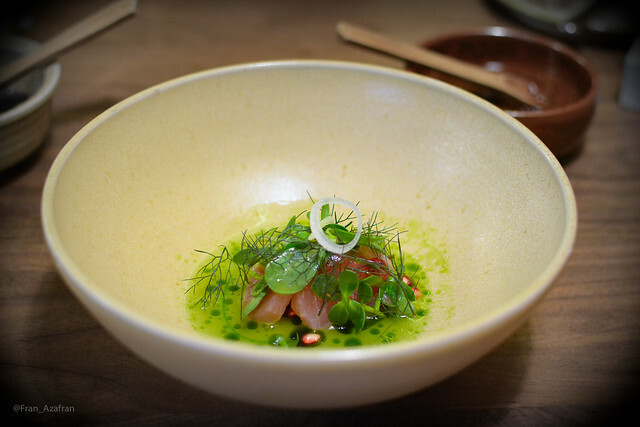 The second course, and the the dish that instantly earned its spot on this list was a bowl of smoked marlin served over a modern version of salsa verde, purslane (or verdolagas, a plant abundant and traditional in the Valley of Mexico), fennel and guacamole. What was presented in that bowl is what I most love about new mexican cooking – something completely new, yet absolutely familiar. Mexico reinvented. Cooked three times: smoked, pan-fried and braised slowly. 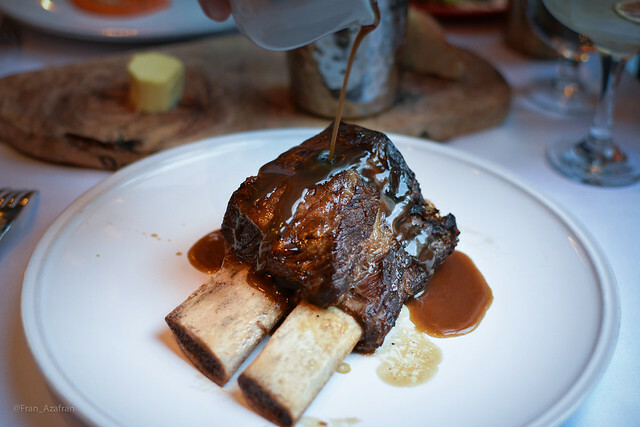 A Flintstone-sized beef short rib that falls apart of softness but maintains the firmness of the meat is all Marcus Wareing needs to prove his worth. Not that he needs to. The dish, as simple as it was, packed the flavor of an entire cow in a not-so-small plate. Here you can turn £29 into sheer pleasure. First dessert on the list. I’m usually not a dessert person. Specially when it comes to chocolate. It’s not that I don’t like chocolate. Come on, I’m not a monster. It’s just that 99% of the times it is just a way to avoid thinking of a better thing to serve. But it can be done right. Perfumed with olive oil and served warm over frozen berries, for example. Temperatures, textures and finesse of flavors. Everything was perfect with this one. There is a LOT to say about this 3-starred Michelin restaurant from one of the world’s most renowned chefs and restaurateurs, but I will leave most of it for another time, it’s only fair. I will say that this was without question the finest display of gastronomic art and hospitality professionalism I saw this year. 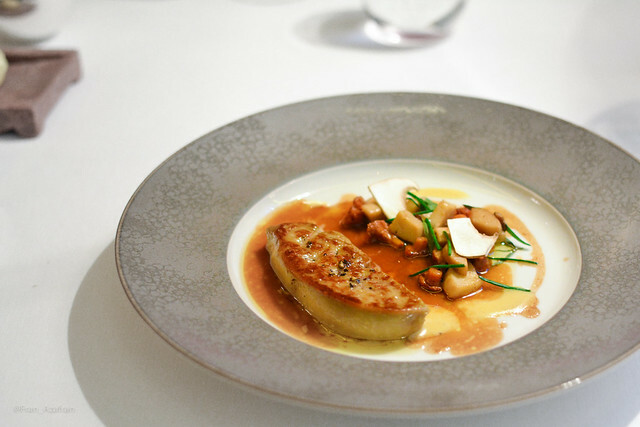 At Ducasse’s there are no lose ends, nothing is left to chance. Every last detail is sorted out for the diners, wrapping them in a blanket of luxury and delight. The meal, consisting of 7 courses, went on for almost 5 hours. At no time did it feel inappropriately slow or left an awkward pause hanging. Every second was covered. What I chose to represent this impeccable meal on this list was the foie gras. Why? Well, it was out of this world. Probably half the cost of the ingredients of the entire dinner was due only to this dish. It looked like a ribeye steak dressed in gold. Perfectly seared, melt-in-the-mouth duck entier over a delicate sauce of Chinese black tea. The cornerstone of the true sybarite’s temple. Tucked away in a tiny street in Lavapiés, close to the center of Madrid is hiding this Galician jewel. 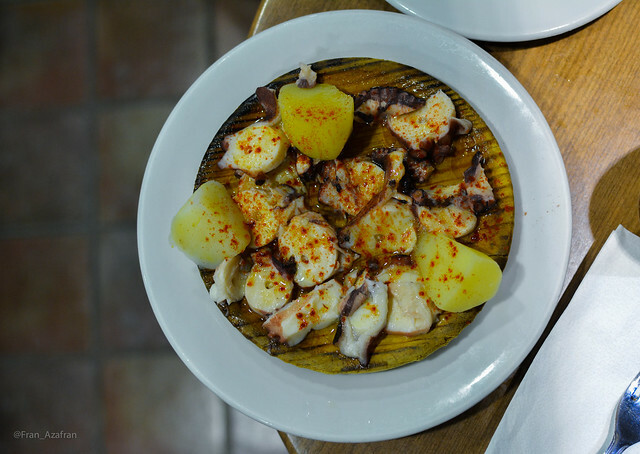 A few euros will buy you two beers and a plate of Pulpo a Feira – octopus dressed with no more than corse salt, Spanish olive oil and paprika. Cachelos, Galician potatoes, are part of the plate too. You can find Pulpos a la Gallega namely anywhere in the world where a Spanish restaurant stands, and you’ve probably had them many times and loved them. So what puts O’Barquiño on top of all the rest? I can’t explain, but I can tell you it’s the best one I have ever had. Very much like the previous entry, this is a neighborhood bar. It’s been run solely by the owner (plus his daughter and one employee) for decades, serving only a few products, combined to create just a few different items. They serve lacón (Gallician pork shoulder) and Tetilla cheese, both of which you can get in a titanic-sized sandwich called a Zapatilla. You can order half and it will easily serve two. Pair with a bottle of white wine – the only one they serve and some of the finest Ibérico ham croquettes. Melo’s asks one thing of its customers, they hope you’re good eating on your feet. There’s something I love about Spanish chefs in general, it’s hard to describe. I believe they show some kind of boldness in the way they create and present dishes. 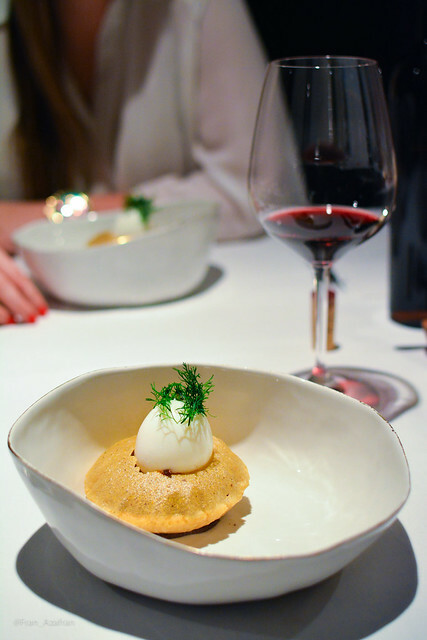 I had a wonderful meal at Sergi Arola’s eponymous restaurant in Madrid last October. Everything about the experience was so theatrical, showlike, starting with the way you’re seated. At a table for two, the diners, instead of facing each other, sit on the same side of a round table, focusing most of the attention on the larger portion of table and the beautiful cabinets on the opposite side of the corridor-like dining room. It was like seating through an edible live movie. The first course being a tour of the country in reinvented tapas, the whole menu was deeply Spanish. Except, maybe, for the final course, a flowerpot. I insist that I rarely would choose a dessert as my favorite course in a meal, especially after being served a plate of magnificent wild sea bream and mussels. But this was something. 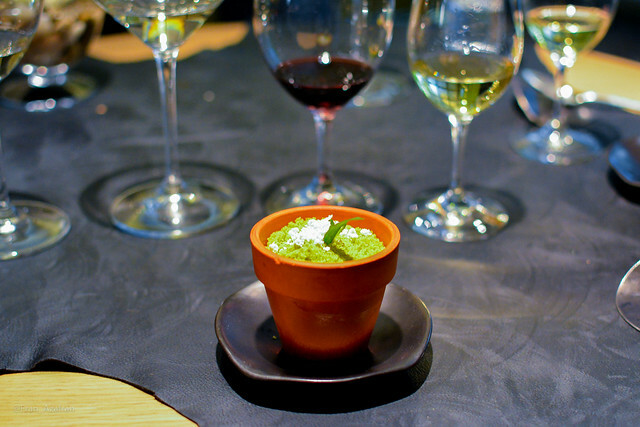 The pot was filled with creamy layers of wasabi, ginseng, white chocolate and pistachio, topped with tarragon powder and more wasabi. Chocolate-wasabi has been one of my favorite combos since I first tried at Elbon the Table in Seoul, and the tarragon just took it to a whole new level. Do I really need to go on? You go on and try it. After years of being on my list, I finally crossed it off in October. Hibiscus is a 2-star Michelin in Mayfair helmed by Lyonnais chef Claude Bossi. I most wanted to visit them this year because they were celebrating their 15th anniversary with a special tasting menu. After six courses – including an amazing plate of roasted red-leg partridge – and some fantastic wines, the meal came to a climax. The final desert course was a custard tart of ceps mushrooms (porcino in italian, hongo pambazo, for my mexican buddies). I still have trouble believing how good that was, and I can’t seem to recall another mushroom-based dessert I have tried before, from the top of my head. The sweet and impeccably cooked custard melts in the mouth while releasing the earthy umami of the ceps. 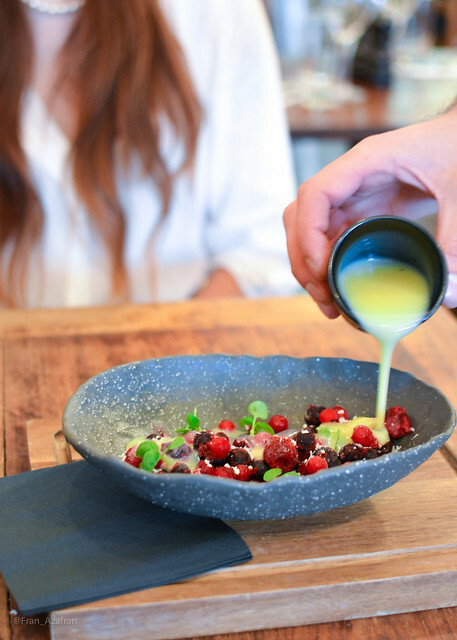 A scoop of vanilla ice cream and a coulis of autumn berries completed the dish. By the way, I know what you’re thinking. Not a dessert guy? Yeah, right. My friend at work first told me about this place. I think he used the words “OOOOHMYGOOOOOOOD! I GOT A RESERVATION AT THE CHILTERN!! !” … He proceeded then to extend me an invitation, which I gladly accepted. Turns out this place is a-buzzin’ all the time and a really tough reservation to make. Seems like the place where all the cool kids are hanging out these days. The place is stunning and, actually, pretty cool, complete with a trap door in the restrooms that leads to a secret smoking lounge. Despite a few shortcomings – like it being overly crowded – I really enjoyed my dinner there. The dishes are cleanly presented and seem very simple, even though a lot of thought went into them. One in particular blew me away, the Ibérico Pork. A meat so fine it almost passed for a very lean cut of beef. I immediately thought Oh, nice, sous-vide, then grilled quickly for color and flavor – led to this conclusion by the perfect rareness of the piece, nearly no cooking gradient and the paper-thin film of char on its outer side. You can imagine my face when chef Powell, after being questioned the cooking method of the dish, said with an air of pride: Nope, we do it right here on the charcoal grill. No water baths around here. I couldn’t – and didn’t want – to make it through the year without visiting Pujol. That tiny, black-walled dining room has a hold on my heart, and palate. Last year I mentioned their mole madre on this list and I should probably do it again – 850 days of magnificent tradition distilled into a mixture of smoked chiles, spices, chocolate and ashes. But (!) in the spirits of honoring another exceptional dish that has not been mentioned before, I decided to tell you about the infladita. It consists of a delicate hollow disc of fried masa, filled with avocado-leaf scented black beans, grasshopper salsa and a perfectly boiled egg in the middle. Okay! We made it to the end. I realize now this list turned a bit longer than I intended, but when I started reviewing my pictures and notes from the year I just couldn’t stop. And believe me, I still forced some stuff out. I also noticed that many of my favorite dishes made the list as representatives of longer and exceptional meals, standing as ombudsmen to other unsung heroes… or, you know, dishes. What I mean is, great restaurants tell stories, they create experiences, and those cannot be reduced to one or two bites. But hey, I need to try, don´t I? I’m personally very excited about the new year, I have big plans. For example, dinner at Alinea Madrid, one of the stages the Chicago restaurant will do while remodeling their main building. I also plan to make it to the Scandinavian countries, where many restaurants topping my list are waiting for me. I’m particularly stressed about eating at Noma before they close and move to their new building next year – I’m clicking on their website a hundred times a day. It’s all about perseverance. I wish you all a wonderful and delicious year 🙂 ! PS. 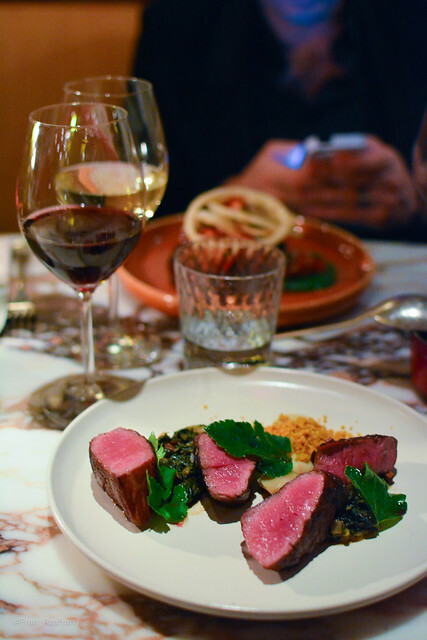 In case you are wondering what that picture at the top is – Herdwick Lamb, Salt Baked Turnip, Padron and Garlic. 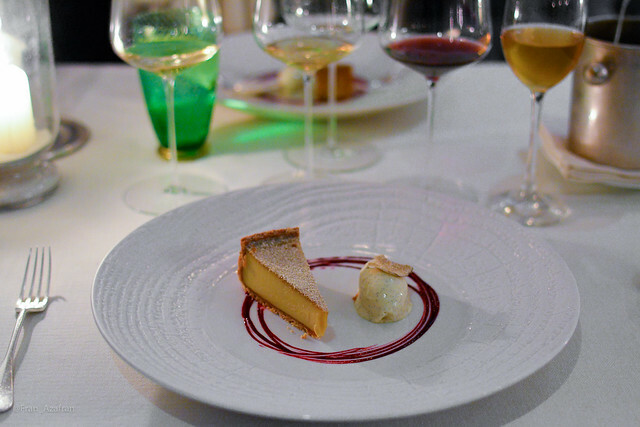 A great dish I had at Brett Graham’s The Ledbury, and one I ultimately ruled out of this list.